The Markets had an extremely volatile session on Thursday as the benchmark NIFTY50 gave up nearly 100-odd points from the high point of the day to end the day with modest gains of 28.45 points or 0.56%. Though the Markets saw a gap up opening and scaled yet another life-time peak, it also tested its 24-month long trend line of a rising channel on the Weekly Charts from which it reacted. We expect a tepid start to the day tomorrow. 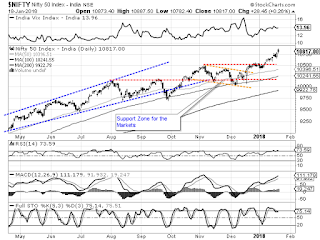 Though there are signs of some tiredness in the Markets, we do not see any significant decline but the levels of 10900-mark will act as fierce resistance tomorrow. The levels of 10865 and 10900 will resist the up move while the supports come in at 10790 and 10775 zones. The Relative Strength Index—RSI on the Daily Chart is 73.5869 and it has marked a fresh 14-period high which is bullish. RSI trades mildly in overbought territory. The Daily MACD continues to remain bullish while trading above its signal line. A black candle emerged on the Daily Chart. However, in the present context this formation holds no significance. 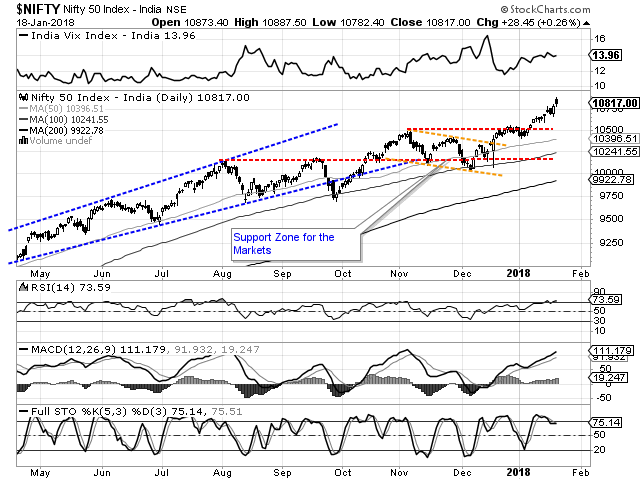 The pattern analysis show the Markets taking a breather after breaking out from the 10490-mark. However, with the Thursday’s intraday high levels, the NIFTY tested a 24-month long trend line of a rising channel and has resisted there. All in all, tomorrow and for coming days, though no major downsides are seen, the volatility will definitely remain ingrained in the Markets as they are pushed into some more range bound consolidation. We expect the Markets to resist to the 10900-mark tomorrow and 10900-10975 range for the coming week. As of now there are no signs of any exhaustion of the trend but we are likely to see good amount of volatility remaining ingrained in the Markets. We recommend staying away from creating any major short positions and continue to make select purchases with each volatile corrective dip.